Will this drink cure your humpday blues? It sure will cure mine! I few weeks ago me and a few other blogger babes headed out to the lovely New York City for a fun night out. It was such a fun night filled with laughter and positivity. One of the best things in life is surrounding yourself with amazing people with a positive soul. 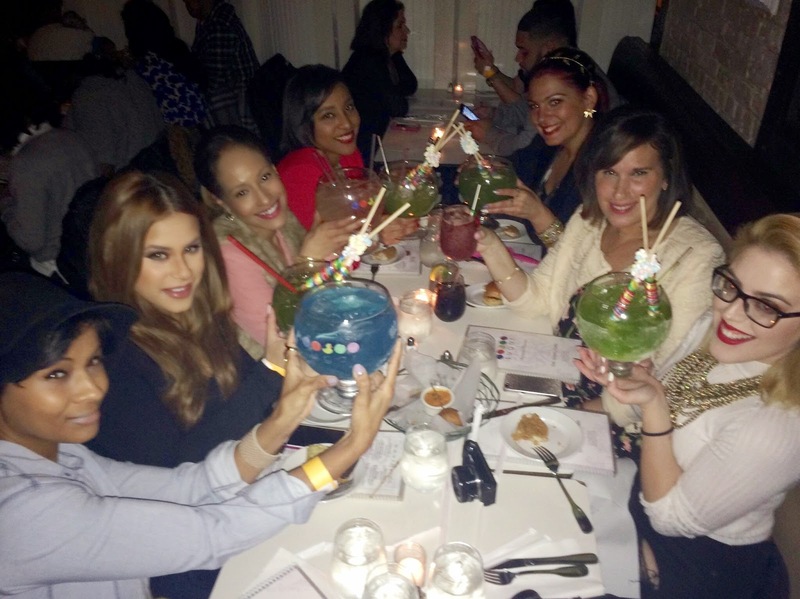 We got together at the Sugar Factory located at 46 Gansevoort Street in the city. I heard a lot about this places with their famous big candy drinks but it was my first time there and it was exactly what I thought, amazing! When we arrived the manager was super sweet and had us waiting at the bar until the rest of the party arrived. Me, Melissa and Jaclynn were the first to arrive and we decided to go ahead and try their signature drink, The Lollipop Passion Goblet. It's a mix of coconut and pineapple. It was so so good and I love that they put the drink in your cup right in front of you so you can see the smoke coming out of it. I felt like a little kid in a candy store. Lol. I shared my drink with Melissa because seriously what human being can finish this whole drink alone. Haha! Once the whole party arrived and we got seated we ordered appetizers, entrees and more drinks. I ordered chicken tenders with french fries. The food was also delicious but I couldn't even finish it because I was full and still focused on the big drink. They have a nice menu selection from burgers to salads and wraps. I did take some food home with me to share with my husband. He enjoyed the food as well. One of my favorite parts of the night was the dessert. I was in awe when they brought it out. The dessert plate was like the size of the table and they brought it out with a sparkler. It was called The King Kong Sundae. By then I was so full but I couldn't leave without tasting that yummy dish. It was 24 scoops of ice cream topped with chocolate chip cookies, gummy bears, marshmallows, Reese's Pieces, bananas, strawberries, waffle cones and more! Let's just say it was a sugar coma. I want to thank Dana for putting this dinner together and Sigma Beauty for our goodies we took home. It was such a fun night and had so much fun with my blogger babes: Dana from Daily Fashionista, Melissa Pereira from Melissa's Sweet Styles, Jaclyn from Blazers and Bellinis, Melissa Flores from Super Glam News, Kyrzayda from Kyrayda.com and Laura from XO Miss Laur. I would totally want to go to the Sugar Factory again and have another yummy drink! Have any of you guys been? If not its a place you'll love.